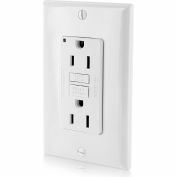 Hubbell-Bryant Commercial Grade, Portable Ground Fault complies with UL 943, OSHA and NEC standards for portable GFCI. 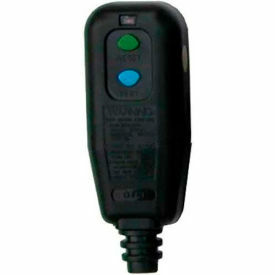 Features & Benefits: Automatic or manual (safe-start) reset types. 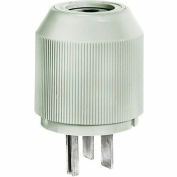 Meets OSHA requirements for open neautral relay protection. Raintight NEMA 3R Rated (Indoor & Outdoor). LED indicator for power and fault status. 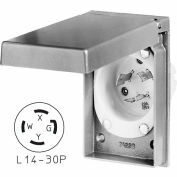 Recessed actuating buttons for reducing damage and accidental operation. 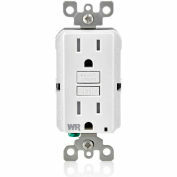 GFCI plug is field wireable. Multi-sized cord strain reliefs (#12, #14, #16 and #18 gauge cord). Housing is high impact thermoplastic. Equipment integrated O.E.M. configurations available. 15A, 125V. UL 943 listed assemblies with load side connectors provided. O.E.M., MRO, Commercial. Cutting Equipment, Power Generators, Vending Equipment, Industrial Maintenance Equipment, Submersible Pumps, Garages, Outdoor Power Equipment, Portable Power Tools, Manufacturing Assembly.